October 7 2018 - Kim Levengrond-Yehezkel, 28, mother of an 18-month-old child, was shot and killed at her workplace by a Palestinian co-worker in the Barkan Industrial Park in the Samaria region of the West Bank. 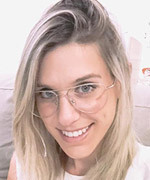 Kim Levengrond-Yehezkel, 28, of Rosh Ha’ayin, was one of two people murdered in a terrorist attack in the Barkan Industrial Park in the Samaria region of the West Bank on Sunday morning. This is the first terror attack in the park, which provides employment for thousands of Palestinians and is often mentioned as a model of co-existence. A third person was severely wounded in the attack, but survived and was transferred to hospital. A law student, Levongrad-Yehezkel worked as a secretary in the plant in which the attack took place. The perpetrator, who also worked at the plant, entered the office, bound her and then shot her. She is survived by her husband, a baby son and her parents. She was laid to rest at the Rosh Ha’ayin cemetery on Sunday 7 October in a funeral ceremony which was attended by hundreds of mourners.